We were sitting in a Greek restaurant talking about dead Italians and organic wines. With the murder of President JF Kennedy thrown in just to add some life-affirming vigour to the occasion. The Fat Greek is a popular joint in Table View, and winemaker Frank Meaker, journalist Greg Landman and myself met there recently to check-out the organic wines Frank is making out at Org de Rac. As well as to fill-up on some Greek food and to discuss and philosophise, as is the want in places Greek. 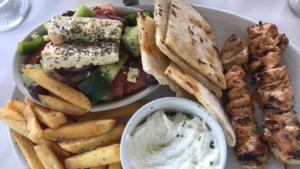 Greg, an expert on all things from that nation including the origin of Nana Mouskouri’s eye-wear and the correct way of milking goats on the Peloponnese Peninsula, had recommended the Fat Greek as he is a well-loved local there. When Greg walked in he was met with an expressive barrage of greetings in the Greek language and his expressive retorts were impressive to say the least. Next time I want to order a real souvlaki or a fake gold chain, Greg’s coming with me. Courtesy of Frank there were a lot of wine bottles making their way onto the table in this light, airy establishment, and conversation quickly turned from Org de Rac’s organic Roussanne wine, stony Chardonnay and sultry Merlot to films of the Mafia variety. The main question of the day being whether the Marlon Brando starring The Godfather was superior to the follow-up in which Robert de Niro played a youthful Don Corleone. 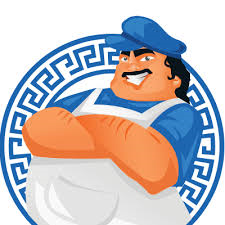 Greek food is a great table-mate when one is talking, arguing and making veiled threats. Greg ordered for us a mezze platter the size of two backgammon boards loaded with delectable portions of the usual suspects one finds in a place like this. There were those goat gonad-sized kefdede meat-balls, dolmades, fried cheese, hummus, chicken kebabs, calamari, tzatziki and pita breads. Now about those pitas. These were brilliant: coloured with that freshly baked hue of gold, they were floppy and airy – far removed from those supermarket-bought pale doughy Frisbees one finds at most of these kind of places. Once baked to a hardened toughness, those kinds of crappy pita can knee-cap a member of the Bandolini family as fast as one can say casa nostra. 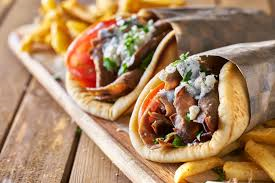 But the Fat Greek’s pitas were perfect, airy and chewy, as tender as an illicit kiss from a Don’s daughter before she had done communion. The dolmades were citrus-flavoured and fresh, stuffed with perfectly cooked rice and a fantastic accompaniment to the Org de Rac Roussanne as the astringency brought out the wine’s accentuation on white fruit. The tzatziki was dense and creamy, the consistency of Ari Onassis’s hair-cream and accurately flavoured with garlic, cucumber and creamy yoghurt just the right side of sour. Kebabs were succulent and juicy with a fine hit of charred grill, the numero one complement to chicken breast. 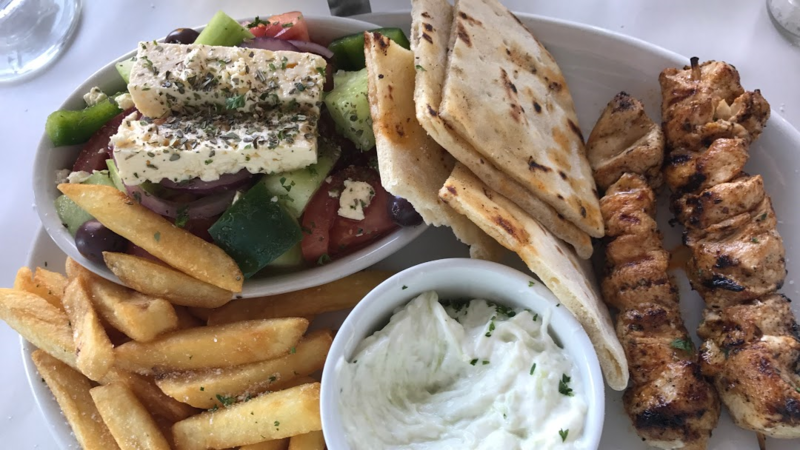 For main courses, Frank had some grilled kebabs of pork and chicken, while Greg decided on a chicken dish that had under-gone some serious Greek treatment. Somewhere under all that there was a breast of, what we were led to believe, perfectly cooked chicken. But from the outside it was all a saucy layer of tomato, olives and feta with no doubt some oregano thrown in. Me, well that pita having gotten to my inner Greek I ordered a pork gyro which basically is one of those whole delectable breads wrapped around some pork, yoghurt, tomato and salad. By this time we were onto Org de Rac Merlot and John F Kennedy, the savoury and red-fruited smooth wine being as fine an accompaniment to the Greek food offering as it was to our debate on the president’s assassination back in 1963. Greg and Frank are conspiracy theorists, believing that JFK was taken out by the Mob on account of (a) him closing down the Cuban drug highway between the island and America and (b) his brother Bobby being attorney general and having declared war on organised crime. I am a lone-wolf Lee Harvey Oswald kind-of-guy, believing Oswald sought his place in history, the best way being to go it alone. The history-talk increased appetite, and the food delivered. Greg’s discerning palate claimed his chicken to be real fine in a country-cooking Greek kind of way, and Frank was plucking the morsels from his kebab-sticks with the relish of a randy rooster picking through the first maize kernels of the day. My gyro was something of true satisfying beauty. It required a two-handed grip to bring the thing to mouth, and once bitten there were cubes of grilled pork, tomatoes, cucumber and yoghurt to complement the familiar delicious taste of the freshly baked pita wrapping. It was messy, sloppy, tasty and satisfying. We ended with coffee only – mine Greek and bitter – despite the waiter making us an offer of baklava we could in fact refuse. This time.